Safe and supportive schools are central to student success. The Every Student Succeeds Act (ESSA) provides significant opportunity and funding for schools and districts to implement key elements of comprehensive school safety, which are outlined in the Framework for Safe and Successful Schools. The framework was developed by the National Association of School Psychologists, the American School Counselor Association, the School Social Work Association of America, the National Association of School Resource Officers, and the National Associations of Elementary and Secondary School Principals to provide clear direction on current best practices for creating and implementing effective school safety policy and practice. These organizations represent key professionals responsible for improving school safety and student success. Blend various funding streams (e.g., Title I, Title II, Title IV) to implement multitiered systems of support to integrate service delivery for all students with efforts to improve school climate and safety. Implement comprehensive school mental and behavioral health services. Provide professional development to improve understanding of how to support children impacted by trauma. Implement evidence-based policies and practices to prevent bullying and harassment. Engage in efforts to prevent violence, including teen dating violence. Provide evidence-based school safety training to teachers, specialized instructional support personnel, and other relevant staff critical to comprehensive school safety efforts. Disseminate and promote examples of best practices in school safety. Improve coordination and collaboration with community agencies in efforts to improve school safety. Balance physical and psychological safety. Comprehensive school safety is supported when schools combine reasonable physical security measures (e.g., visitor check in procedures, locked doors) with efforts to enhance school climate, foster respectful and trusting relationships among students and staff, address students’ mental and behavioral health (including providing trauma-sensitive supports), and promote overall student success. Integrate service delivery systems. Safe and successful learning environments are fostered through collaboration among school staff and community-based service providers while also integrating existing initiatives in the school.Integrated academic, behavioral, mental health, and social services lead to more sustainable and comprehensive school improvement, reduce duplicative efforts, and require principal leadership and a commitment from the entire staff. Improve access to comprehensive, school-based mental health services. Access to school-based mental health services directly improves students’ physical and psychological safety, academic performance, and social–emotional learning. This requires adequate staffing levels in terms of school-employed mental health professionals (school counselors, school psychologists, school social workers) to ensure that services are high quality, effective, and appropriate to the school context. Importantly, increased access to these professionals empowers school leaders to more effectively deploy resources, ensure coordination of services, and enhance collaboration with community providers to meet the more intense or clinical needs of students. Employ positive discipline practices. Positive discipline enhances positive behavior, supports an environment where students feel respected and supported, improves student engagement, fosters home–school–community relationships, and improves school climate and safety. In contrast, overly punitive measures reduce student connectedness, do not improve student behavior, and negatively impact school climate and safety perceptions. Incorporate appropriate professional development, training, and planning. School crisis and emergency preparedness training should encompass prevention/mitigation, early intervention (which is part of ongoing school safety), immediate response/intervention, and long-term recovery. Training and planning must be relevant to the learning context, make maximum use of existing staff resources, and involve reviewing and practicing safety and crisis plans. Establish a multidisciplinary school safety and crisis team. Comprehensive school safety planning and implementation must be led by a multidisciplinary school safety and crisis team that includes, at a minimum, principals, school employed mental health professionals, school security personnel, and appropriate community stakeholders (e.g., law enforcement). The team must be empowered to understand and identify areas of risk and need that are unique to the school in order to address preparedness objectives related to prevention, mitigation, protection, response, and recovery. Effective efforts build upon ongoing school safety and mental health services. Develop and integrate various school improvement efforts into a cohesive system (e.g., MTSS) that fosters school climate, prevents violence, balances physical and psychological safety, and provides comprehensive interventions and supports to meet the academic, social, emotional, mental, and behavioral health needs of students. Improve access to comprehensive school mental health services that are delivered to also support learning. Provide risk and threat assessments. Identify students at risk, consult with teachers and administrators, and support immediate and long-term recovery after a crisis event. Assist in the planning, development, practice, and periodic review of evidence-based school and district-wide crisis response policies and practices. Deliver professional development to improve school and staff capacity to improve school climate and safety. Foster enhanced home–school–community collaboration to reduce violence and improve school safety. 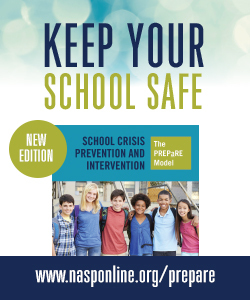 The Framework for Safe and Successful Schools, the PREPaRE School Safety and Crisis Curriculum, and other comprehensive school safety resources are available at http://www.nasponline.org/resources-and-publications/resources/school-safety-and-crisis. Additional ESSA resources are available at http://www.nasponline.org/essa. This handout provides an overview of school safety in ESSA's provisions relevant to decision-makers. Download a PDF version of this handout to share with your colleagues. View a companion handout for school psychologists.